How much N has been lost this year? The first half of July started cool and wet as expected. The question is will the second half turn warmer and drier as we expected a few weeks ago. The overall answer is yes. Overall, weather, climate and hydrology conditions will improve in Ohio after the start of this week into the end of July. After a wet start to this week we expect a drier Wednesday and Thursday. However more showers and storms will return Friday into the weekend. But the pattern looks to be heading toward a more summer-like pattern where the rainfall pattern becomes more scattered and typical after this week. At the same time, temperatures will become warmer than normal. With all the moisture in the ground, we continue to see daytime temperatures kept down some and nighttime temperatures elevated and this will continue with the overall tendency toward slightly warmer than normal temperatures. Temperatures Risk...slightly above normal (mostly from overnight lows) highs mostly in the 80s and lows in the 60s. Rainfall Risk...becoming more normal and scattered after this week most places 2-4 inches next 3 weeks. Normal is 3 inches. Rainfall Risk...return to slightly above normal. Finally, El Nino is in full swing in the equatorial Pacific Ocean and is likely to strengthen in a significant El Nino for fall and winter. El Nino will likely persist into spring growing season next year and will play havoc with our weather, climate and hydrology patterns in Ohio. 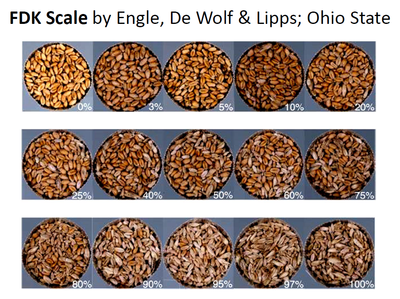 Our research shows during El Nino events crops are stressed in Ohio form significant changes in our weather patterns. Impacts are greatest to wheat and corn and to a lesser extent soybeans. Rain. Rain. Rain. With excessive rain, chances are good most fields across this state have lost more N than in a typical year. But how much have they lost? Everything applied? Is all of the N fertilizer gone? Although it’s difficult to estimate, it’s very unlikely that the majority of the N applied has been lost. Nitrogen losses in Ohio fields occur by two main pathways: denitrification and leaching. Both pathways occur with nitrate (NO3-), a form of nitrogen that is readily available for plant uptake, but also susceptible to environmental loss. Denitrification is more prominent in heavy, poorly drained soils while leaching occurs more in lighter, well drained soils. Most soils will experience some N loss through both pathways, but the proportion from the two pathways can vary dramatically between soils. Denitrification is the gaseous loss of soil nitrate. It is a microbially-driven process that occurs to some degree throughout the growing season, but is especially problematic when soils are saturated and oxygen is depleted. Saturated soil in late spring/early summer are especially prone to N losses by denitrification since it is a time when many fields have N fertilizer applied upfront and crop uptake of N is very low. This can create an environment when soils are N saturated and denitrification is rampant. Many factors influence denitrification, but the three most important are 1) saturated, anaerobic soil; 2) quantity of nitrate present; and 3) presence of crop residue on soil surface. Soil N losses from denitrification vary greatly year to year, but can range from 2-25% in well-drained soils and from 6-55% in poorly drained soils. Note that tiled fields would generally not be considered poorly drained. Leaching is the other main pathway of N loss. Unlike denitrification, nitrate leaching is not a microbial reaction. It is the loss of soil nitrate below the rooting zone by water. Nitrate leaching is heavily influenced by soil water flowing through the profile, which in turn depends on total rainfall and crop uptake. Like denitrification, N leaching is very common in late spring/early summer, especially with saturated soils. Tiled fields may lose 30-40% of applied fertilizer annually, but again, precipitation patterns and crop cover strongly influence losses by leaching. Farmers can reduce chances of N losses from denitrification and leaching in a variety of ways. Perhaps the most important is timely applications of N fertilizer via side dressing. Other practices include rotating with winter wheat, cover crops or forages, use of nitrification or urease inhibitors, and use of controlled release fertilizers. Although sound N management is incredibly important for crop nutrition, some years prove to be especially challenging, as this year is demonstrating. 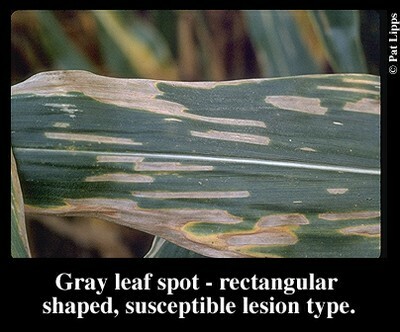 Foliar diseases continue to spread up the corn plant in some fields, so, this may be the year to apply a foliar fungicide to minimize losses due to diseases such as Northern Corn Leaf Blight (NCLB) and Gray Leaf Spot (GLS). 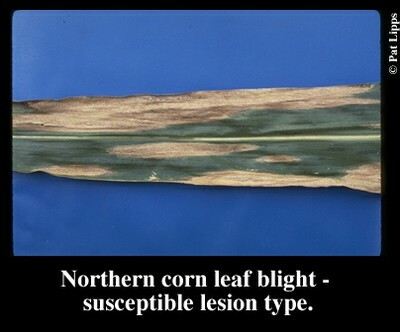 Both GLS and NCLB may cause yield losses as high as 50% if they become established before silking (R1) and cause substantial damage to the ear leaves and the leaves above the ear before grain fill is complete. The current weather forecast suggests that conditions (wet and humid with moderate to warm temperatures) will continue to favor the spread of GLS and NCLB as fields begin to tassel. So, this would be the time to protect the upper leaves with a fungicide, particularly if your hybrid is susceptible and your field is in an area with a history of foliar disease problems. More of the available fungicides are effective against GLS and NCLB, so follow the labels and keep your eyes on the fungicide price and application cost when making a decision. Unlike diseases, we are not seeing any major problems with insects, so we do not see any reason why you should tank-mix an insecticide with the fungicide. This is not something that we would ever recommend without inspecting your field for the presence of insects. There may be some silk clipping occurring by Japanese beetles or western corn rootworms, but any impact on kernel set or yield would be rare. Clipping would have to occur: 1) during the first week of silking, 2) with less than 50% pollination, 3) silks < ½ an inch and 4) Japanese beetles reaching a count of 5 per ear or with rootworm adults reaching 3 per ear, for damage to be economic. These beetles tend to be on the edge, so make sure you scout the entire field before considering insecticides. Not only will this save you money, but also help prevent insecticide resistance. Although scab was not widespread in Ohio this year, there were a few pockets with high levels of the disease in some parts of the state. In addition, persistent rainfall over the last several weeks has caused producers to be concerned about grain quality even in fields without high levels of scab. One of the main questions being asked is whether scab will affect the quality of the wheat seed this fall. Yes, scab will indeed reduce seed quality tremendously, causing germination rates and stands to plummet. However, the vomitoxin that is usually present in scabby seed is not your biggest problem in terms seed germination, damage to the embryo is your problem. You should first pull a grain sample from your lot and determine how badly damaged the kernels are. 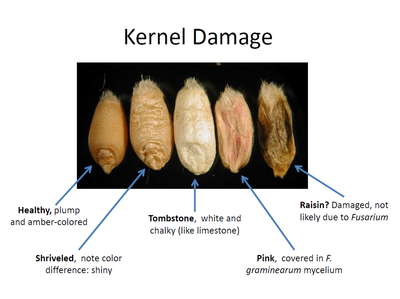 You can do this by estimating the percentage of Fusarium damage kernels (FDK) - small, shriveled, light-weight, and discolored (pinkish-white) seeds. FDK will give you a very good measure of seed quality. If you have more than 30-40% FDK, then I would suggest not using your scabby wheat for seed. However, if you absolutely HAVE to plant scabby wheat, cleaning, germ test, and fungicide seed treatment are absolutely necessary. Seed treatment will only help to a point, but you should still treat the seed and try to do so as soon as possible to reduce further fungal growth. Cleaning will get rid of light, scabby materials, and this will naturally increase the test weight of the lot. If you can increase the test weight to about 56 lb/bu after cleaning and your germination rate is above 80%, then you have decent quality seed. Gravity table would be your best option for cleaning. In addition to cleaning and treating, seeds should be stored under cool, dry conditions until planting to prevent mold development. Blending of scabby wheat with healthy wheat is another good option to increase the overall quality of the lot. Increasing the seeding rate will also be helpful, but you should determine percent germination first - this will help you to adjust your seeding rate accordingly. 5- Increase seeding rate is your germination rate is below 80%. 1. Wait at least a week or so after harvest (grain should be allowed to dry in the greenhouse). 4. Use scale below to estimate where your subsample fits into the scale. 5. Record FDK %. Dump grain back into bag. 6. Repeat 2‐5 until you have 5-10 FDK readings for each bag of grain. The HAB forecast is coordinated by NOAA with other partners. The forecast and monitoring report of current HAB severity is updated about once a week through late summer at http://www.glerl.noaa.gov/res/waterQuality/ . 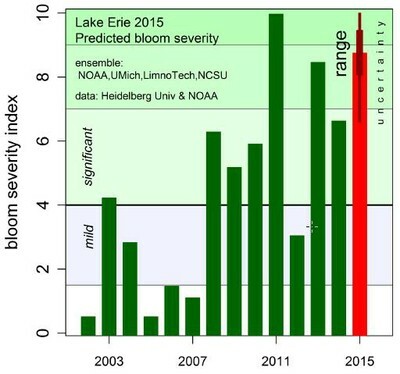 The prediction severity of the western Lake Erie cyanobacterial harmful algal bloom (HAB) is dependent on phosphorus inputs from March 1st through July 31st, called the loading season and is used for prediction. The amount of Dissolved Reactive (or Soluble) Phosphorus (DRP) has the greatest correlation and is used for the modeling efforts. The cumulative loading of DRP and Total P is shown with 2015 (Red) accumulation to date compared to year 2011-2015. Note the dramatic accumulation starting with June 1 rainfall events. Figure 1. Spring Phosphorus loading numbers from the Maumee River (Near Waterville). Summarized is Cumulative loading of Dissolved Reactive Phosphorus (left) and Total Phosphorus (right). Source Heidelberg University. These cumulative numbers are used to develop the likely forecast of the severity of HAB’s in Lake Erie. The scale is 1-10 with 10 being 2011. Figure 2 shows the prediction of 2015 with a range of severity that could place the current year between the 2013 and 2011 year blooms with a significant bloom. Figure 2. 2015 Predicted HAB Bloom severity. Source: NOAA. 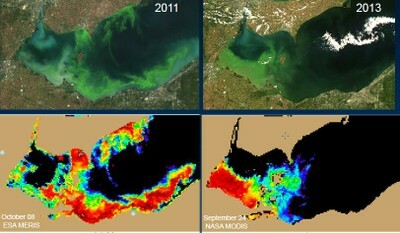 Figure 3 shows a MODIS true color image (Top) and Cyanobacterial Index from NASA’s MODIS-Aqua data (Bottom ) for 2011 and 2013 at peak bloom for each year. The MODIS-Aqua data gives a concentration index with the red color indicated a higher concentration and the blue a lower concentration of cyanobacteria which is the organism of concern with HAB Blooms. Figure 3. Peak bloom images for the 2011 and 2013. Source: NOAA. The Northwest Agricultural Research Station will host the Ohio State 2015 Field Crops Day on Thursday, July 30 from 9:00 am – 11:30 am. The field day is located at 4240 Range Line Road, Custar, Ohio. It is free and open to the public. The agenda includes: Management of Soil Borne Diseases, Nine Year P and K Fertilization Study, Drought Tolerant Corn Hybrids, Soil Quality Testing and Recommendations. Ohio State University Extension speakers include: Anne Dorrance, Steve Culman, Peter Thomison, Alan Sundermeier. Pesticide Re-certification and CCA credits are available. No reservation is needed. For more information contact Matt Davis at 419-257-2060.